What do you get when you combine a place for your own customizable homepage, social networking, your own personal website, and other common Internet elements into one website? You get ZooLoo, which is sort of like iGoogle meets Facebook (or MySpace) meets GoDaddy meets Webshots meets iWeb meets..….well, you get the idea, everything about the Internet in one place. The first page that ZooLoo users go to (once registered; will get to that later) is the "Social" page. This page operates like most other social networking sites in that you can post status updates, control messages, upload photos, and so forth. 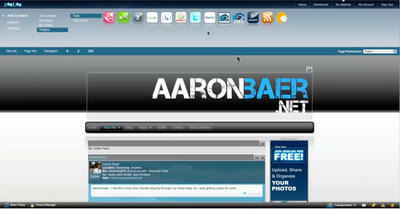 However, one significant difference is the ability to manage and display multiple social networking sites in one place. In addition, ZooLoo does incorporate its own version of a social networking, but it also allows for the integration of other common social networking sites such as Facebook, MySpace, and Twitter. There is potential for other sites to make their way here too, so expect this to grow overtime. The next major element of ZooLoo is the "Dashboard." This is like ZooLoo's version of iGoogle. The Dashboard does have a decent and well-designed homepage, in which all you do is drag and drop the widgets from the menus (over 700 widgets and growing, a nice selection by the way) and they appear on your dashboard. There is just about everything from weather, sports scores, movie times, dictionary, Twitter, Facebook, eBay, just to name a few. You can even create multiple "tabbed" dashboards, thus allowing extra dashboards for more flexibility and organization. 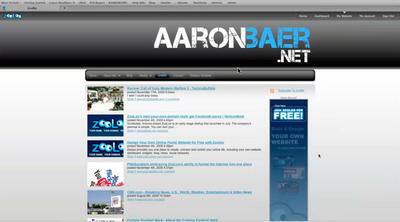 Another major element to ZooLoo is the ability to create your own personal website and/or blog using the "Web Editor." This tool makes for easy page and subpage design, giving you the choices of your design, themes, fonts, templates, and layouts. Throw in the option to add RSS feeds, photos, videos, widgets, blogs, graffiti (a collection of referenced websites and shopping items), and website building is a snap. Everything on zSocial is automatically private, but using ZooLoo's drag-and-drop Privacy Manager controls (under "Privacy Manager"), managing your privacy is a breeze. 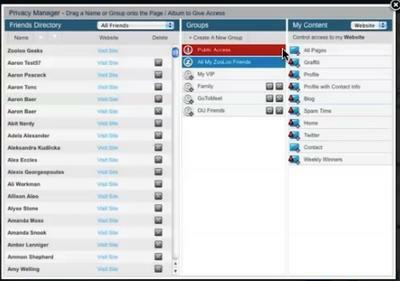 Just drop your group or each person into the proper control folder under My Content, and you can have one person or group view one thing, while they can't view another, thus giving you flexibility. Things that can be controlled include your web pages, blogs, photos, videos, your profile, albums, and other specific content. ZooLoo also comes equipped with a few compelling features that I found to be quite interesting and unique. The first is the "Graffiti" page which allows for users to post anything interesting the user sees on the Internet, whether it's a website, a product from an e-commerce site, an audio/video clip, just to name a few. The Graffiti page allows provides the option to share this with anyone on your social network(s). Another feature is the "zButton", which can be found on the Graffiti page. All you have to do is drag and drop this so-called button to your browser's bookmark toolbar, and anytime you see anything interesting on the web, you click on this button and it automatically stores it on your Graffiti page (or as a bookmark) without having to go to ZooLoo.com. It's a convenient and very cool feature nonetheless. How does one get a ZooLoo account? Well, ZooLoo offers two choices: "ZooLoo Free" (which by it's name is free) and "ZooLoo Plus" ($29.99/year). ZooLoo states in its slogan, "Your Name. Your Domain. Your Life." That's that's the beauty of ZooLoo, in that you can choose your own personal domain. Depending on which account you pick, you can create your own personal domain. The ZooLoo Free account allows for a "yourdomainname.zooloo.com" domain, while the ZooLoo Plus account allows for a "www.yourdomainname.com." Even if you choose the ZooLoo Plus account, users have the option to alternate to the ZooLoo Free domain, which everyone gets no matter what you pick. All-in-all, ZooLoo.com brings the entire online experience into one place. In fact, it very well could be your browser's homepage. ZooLoo is continuing to evolve and sites features are expected to be added to the site. It looks to become a very popular site overtime and it does have a ton of potential, if it hasn't already gained a lot of notoriety. The goal of ZooLoo is clear, it wants to give you what you want out of a personal website and central page. This and everything else is where ZooLoo excels.